Hand crafted metal thread, iron, and copper shape the primary structures of this object: circles, squares and rectangles with diagonal crosses in the corners and in the middle. Squares are located within rectangles which are interrupted and connected by ‘cornerstone’ triangles. The central circle surrounds a stone, which is crossed over by thread that has its centre in the circular eye. The inner circle’s movement continues in the circles around it, in broken but still connected lines. It may remind us of a stone that we have thrown into the calm surface of a lake, spreading its rings all over the water. The design of The Golden Rule by Norwegian artist Grete Refsum appears modest. In its clarity and consistency it is however deeply rooted in traditional wisdom from the East and the West. We can rediscover the ancient thinker Vitruvius’ classical theory of harmony in architecture in the artwork’s elegant arrangement of ever bigger squares – a simple construction but very strong and abiding through millenniums of historical change. According to Plato the circle represents the most perfect form, not based on its round form but due to its line’s movement without beginning and end, where everything can start and end everywhere and where neither beginning nor end limits the power of motion. The diagonal cross embodies a rich field of meaning of which the martyr’s death of St. Andrew on such a cross is most important for the artwork at hand. Refsum’s object can be approached as image, sculpture, craft, text or architecture and perhaps as all of them together. Try to shift between these five modes of viewing and let them flow into each other. For those who would like to start with words the artwork is again firmly rooted in proven wisdom. It intends not just to combine two formulations which have carried the civilizations of the East and the West through thousands of years, but also aims to interconnect and integrate them. The Golden Rule, which in the Old and New Testament has inspired the command to love your neighbour as yourself, surrounds Refsum’s work. Nestled within this quotation is the prohibitive saying from Confucius (in Chinese characters) which has influenced the whole of North West Asia until today: ‘Do not do to others what you would not like them to do to you.’ Whether these two central formulations of the Taoist and the Judeo-Christian religions express the same thing and how they have affected the moral dimension of cultural history in the East and West, we can best leave here to the experts. 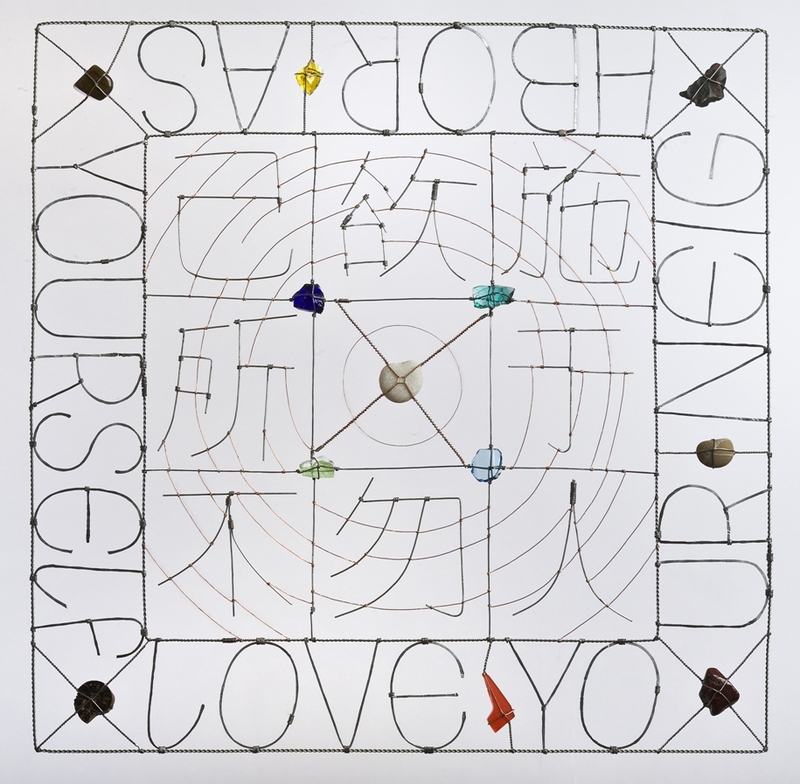 Refsum’s work leaves it open, either to regard the biblical command as the culmination of all wisdom or to view the Taoist saying as the inner circle. No matter which order you prefer, the work offers a clear statement about the centre of both the circle and the square which is formed by the martyr’s cross. You can approach it from within and from without. With some imagination the viewer may perceive how the diagonal cross starts to activate the circle to disperse its power over the entire image and those contemplating it. Light, which is sparingly but strongly massed in the glass fragments, begins to radiate its coloured power to the rest of the work and beyond. The stones make the whole vibrate with a melody from far away and deep within, possibly leading us to a land which God ‘has shown us,’ the place from where the stone was thrown which started to diffuse its life-enhancing law and motion over all creation. Who has thrown this first stone? What an inspiring experience to move around in a work in which directions of wisdom and life emerge from designed shapes. Grete Refsum captures a balance of morality, form and light in a visible and tangible “aesth/ethics”. May it inspire us all to love our neighbour by not doing unto them what we do not want to be done to us, and more! Grete Refsum, The Golden Rule, 2008 (concluding object in the exhibition The Way of Christ/The Way of Dao & Deus ibi est).